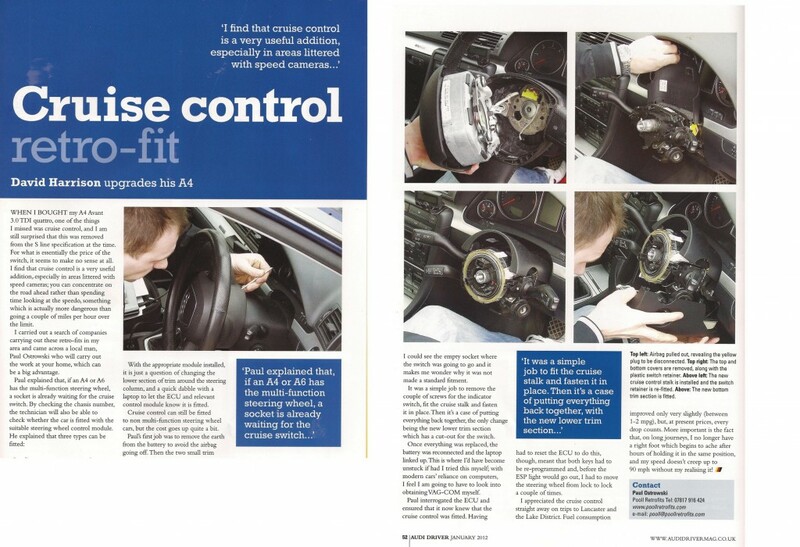 Professinla Retrofits Limited in Audi Driver Magazine!!! WHENE I BOUGHT my A4 Avant 3.0 TDi quarrto, one of the things I missed was cruise control, and I am still suprised that this was removed from the S line specification at the time. For what is essentially the price of the switch, it seems to make no sense at all. I find that cruise control is very useful additional, esoecially in areas littered with speed cameras; you cam concentrate on the road ahead rather than spending time looking at the speedo, something whitch is actually more dengerous than going a couple of miles per hour over the time. I carried out a search of companies carrying out these retro-fit in my area and came across a local man, Paul Ostrowski eho will carry out the work at your home, whitch can be a big advantage. With the appropriate module installed, it is just a question of changing the lower section of trim around the steering column, and quick dabble with a laptop to let the ECU and relevant control module know it is fitted. Cruise control can still be fitted to non multi-function steering wheel cars, but the cost goes up quite a bit. I colud see the empty socket where the switch was going to go and it makes me wonder why it was not made a standard fitment. It was a simple job to remove the couple of screws for the ondicator switch, fit the cruise stalk and fasten it in place. Then it’s a case of putting everything back together, the only change being the new lower trim section whitch has cut-out for the switch. Once everything was replaced, the battery was reconnected and the laptop linked up. This is where I’d have become unstuck if had I tried this myself; with modern cars’ reliance on computers, I feel I am going to have to look into obtaining VAG-COM myself. Paul interrogated the ECU and ensured that it now knew that the cruise controlwas fitted. Having had to reser the ECU to do this, though, meant that both keye had to be re-programmed and, before the ESP light would go out, I had to move the steering wheel from lock to lock a couple of times. I appreciated the cruise control straight away on trips to Lancaster and the Lake District. Fuel consumption improved only slightly (between 1-2 mpg), but, at present prices, every drop counts. More important is the fact that, on long journeys, Ino longer have a right foot whtich begins to ache after hours of holding it in the same position, and my speed doesn’t creep up to 90 mph without my realising it. For all enquirers please contact us via e-mai, phone or our “contact form”.